*Phaedra Parks has quite the admirer. Nicki Minaj is a fan of the “The Real Housewives of Atlanta” star. Minaj revealed she and her girlfriends watch “RHOA” just for Parks. According to Sister 2 Sister, Minaj is impressed with how Parks can use her sharp tongue to rip through her enemies or challengers on the show. For example, Phaedra Parks blasted Kenya Moore for talking about her husband Apollo Nida. “While she’s sitting around running around talking about my husband and the father of my children and she spends her weekend peddling through sperm banks, looking through catalogues trying to find a donor. Honey, you don’t know whether your babydaddy will be an axe murderer or a child molester because what you will know is that he needed $10 to get him a medium-sized pizza, so he ejaculated in a cup, so you could have a kid,” Parks said. Minaj is such a fan she included Parks’ “Fix It, Jesus” phrase in a one of her recent songs. Overall, Minaj loves more than Parks’ words, but her delivery. 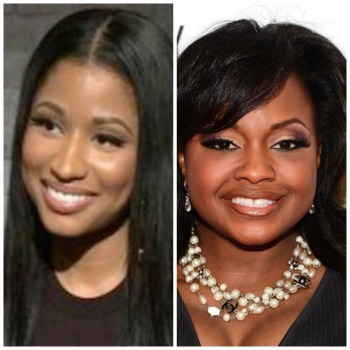 Nicki she don’t know how dirty hands of Phaedra be. Soon 2be charged by Feds ‘n then bye-bye belle pie. Lttleboots knows. Washington knows. PHAEDRA IS THE ONE OF THE SWEETEST CAST MEMBERS ON RHOA SHE HAS NEVER BEEN CHARGED WITH ANY CRIME SO SHE’LL BE OK. I LOVE HOW NICKI MINAJ KEEPS IT REAL LOVE HER MUSIC. … now this is real reporting, whoomp! whoomp! Whoomp! I love me some Phaedra Parks too. Man, her tong is swift…no raising her voice and no swearing needed to shade someone…no one does it better.